Left Juarez 8:10. Caravan started leaving 8 shart. Weather fine but a little chilly. What a sight after we all got strung out on the Highway. Over 200 trailers. Have to be seen to believe. Met up with our neighbors, Mr. & Mrs, North from MO and Mr. & Mrs. Luckynot from WA. Back to Juarez for a few highlights. “The Banquet” needs some mention. Our introduction to the land of Mananna. Soup, cold beer. Shrimp cocktails – ran short and served fruit instead. By the time turkey was served at our table everything began to run short. I doubt if some of the people got anything to eat. The floor show was something they picked up out from one of the drivers in Juarez. But all in all we had a nice banquet. Now back on the road to Chihuahua. The road is narrow and bad shoulders. We were traveling too fast so three of us decided to travel together and drive slower. Stopped for lunch about 1 o”clock. Arrived in Chihuahua about 3:30 pm. All three of us parked together. State Band here to greet us and a Mariachi band to entertain. Spent the evening sitting out in front of our trailer with our neighbors and enjoyed the new moon. Very beautiful. The next morning she gave us a bunch of canned goods, some fruit cake and pecans which we appreciated very much. 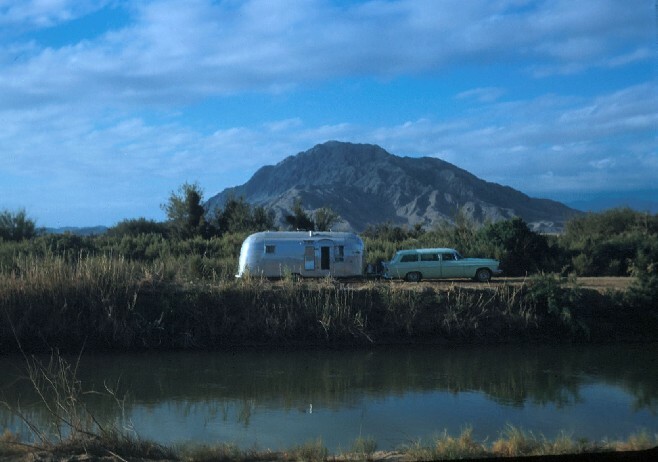 We went back to the trailer just before noon, got ready and came on down to Juarez and was very glad we didn’t wait till today as they were running out of space in the ball park and some of them (caravanners) had to park outside in the street. They have had quite a lot of meetings today. We registered, got our berets, identification cards, tended to our insurance and are almost read to go. I am cooking a supper so as to get it over with before dark. 2/26/57 – Sautillo – cloudy and windy. Swell new road to Sautillo – lots of jucca – desert country. Arrived about 2:30. Trailer Park at Huachest Court – 12 pesos – light and water, sewer, swimming pool. To market in p.m. Very cloudy and cold – some rain. Supper in trailer. 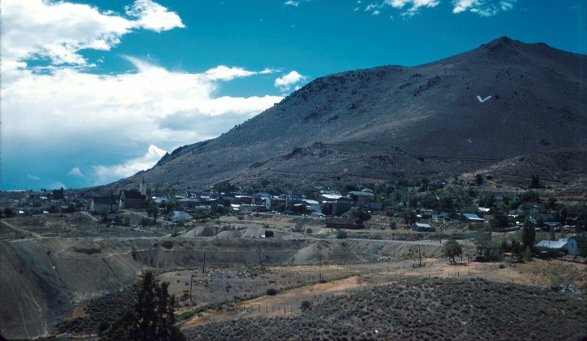 2/27/57 – Town in a.m. For more sight seeing. Made some purchases. Left camp 1:30 for Monterrey and points north. Menterrey large city – industrial – surrounded by mountains. Drove on through. Camped on road at Vallicillo. Last supper outdoors. Laredo tomorrow. 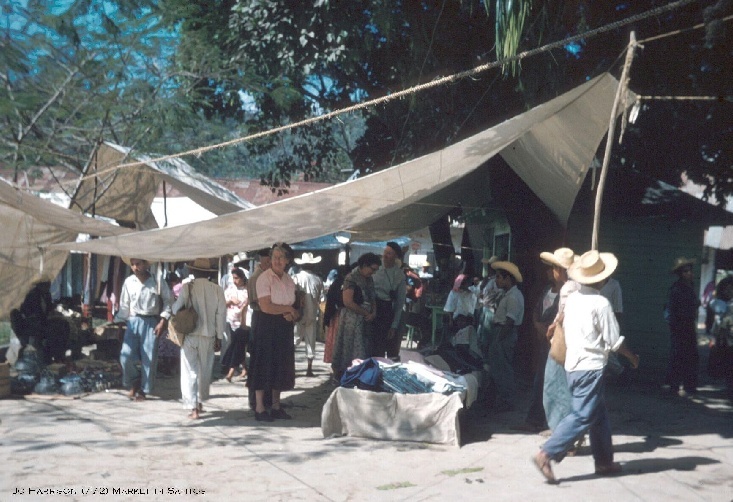 2/24/57 – Trip to Santos market day. Dr. Caryslie, guest Indian in gay dresses – very colorful. Pot luck supper in our patio with 9 other caravanners. Leave in a.m. For Sautillo. 2/25/57 – Left camp about 8:30 – road bad but weather good. Took road to Sautrella in prefernce. Solote Falls side trip – gravel road – beautiful falls – camped in hacienda of Jorge Pasqual on road to Sautello – not much mileage today. More mountains- bypassed Victoria. Hacienda of Jorge Pasqual has a beautiful mosaic design on walls etc. 2/21/57 – El Bonito – weather cloudy – real jungle country – rain last night. 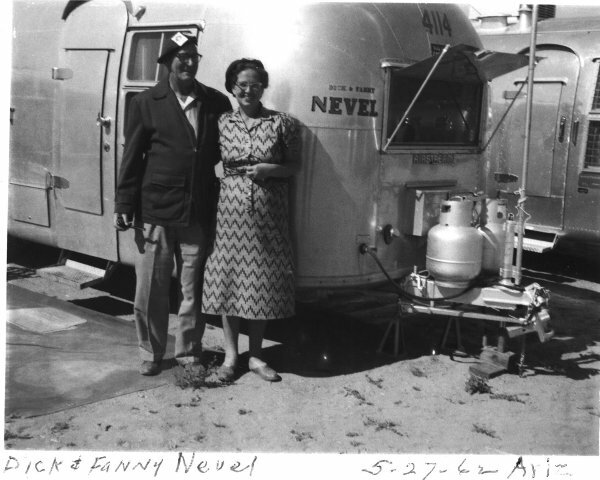 We decided to stay over – to town in the a.m. (Valles) Nice town – gas for trailer, gasoline for car, bottled water. Good looking vegetables in market – fresh meat. Swim in pool of warm sulphur water in p.m. – very nice. This is a real nice place. Unable to take any pictures due to weather. Supper in patio. 2/22/57 – Still cloudy in a.m. – left with car for trip to Tampico – rainy, no chance for pictures – bad detour, lots of much – just before Tampico road which was washed out during a hurricane last year. Drove over to beach, lunch out on breakwater – not too much time to look around – very muddy and dirty. Will not take trailer over to Tampico – lots of water everywhere. Good trailer park washed out last year. Back to camp by 6 p.m. Rain most of the way. 2/23/57 – Rain during the night. Tried fishing in the river. Ruin of hotel from hurricane. 7 Caravanners arrived in camp. Mexican service n.g. – Good swimming. 1/30/57 – Short drive to Morelia – good camp – just out of town – shopping tour with friends. Mom has hair-do – few purchases – great shopping center – beautiful city – meeting at 5p, “Toluca manana” we are told quite a blimb over 9,000 ft – more later – the shooping center or market place – so many variets of good woods – can’t decide. 2/1/57 Toluca – weather cludy, looking stormy. Left about 7:45 am from Morelia 150 some miles – and some miles twice. We wer up over 9,000 ft but everything went well – beautiful country – lots of pines and various other trees – high mountains -fair road. Lunch before arrival in Toluca – quite a city – din’t realize we were up over 8,000 ft – high mountain in background with snow. Friday market day – went to market after arrival – no words can describe the scene – hundreds of people – natives, Indians, Americans, and block after block of wares on display. Everything a person can imagine and then some. 1/26/57 – Bus shopping tour of the city – rest in the afternoon Symphony Concert in the evening – very good. 1/27/57 – Church service at 9:30 – nice – pot luck dinner with six friends at 1 pm. 2:30pm walking tour of the city and picture taking. – to bed early fro trip to Morlera in the morning – very enjoyable day – Pineapples, bananas, Apotes, Cherimoyas, mexican fruits, blackbirds – good Mexican bread and cookies. 1/28/57 – Monday Patzcuaro – good weather, nice and warm cool nights – left Guanahuato 8am – wonderful farming country, irrigation in most of the large valleys – fair road – bad sholders – two detours on hill – streets very hard – dips – many trailers hit bottom – 158 miles – bypassed Morelia – going back after hard drive, many hills. Arrived 2:30 pm – Patscuaro – cool in am but wonderful and warmer as day progresses. Campground very very pretty – pine trees – mountain lake beautiful place – no rest for change – meeting time 4pm – various tours outlined – supper – card game with our friends. 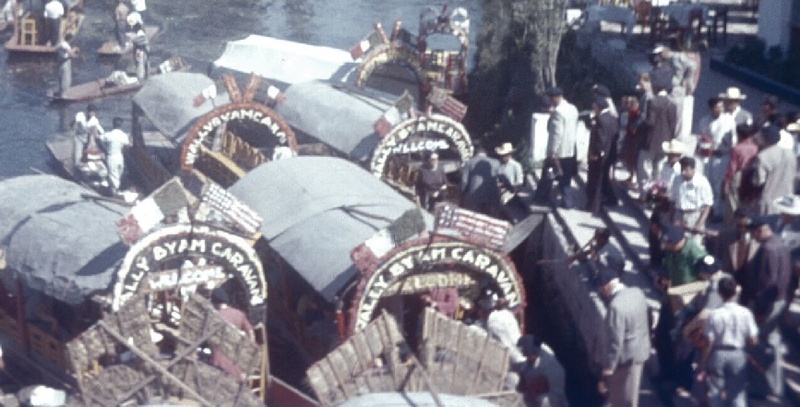 1/29/57 – Patzcuaro – no shops so took shopping tour to Buraga back 10 miles – much pottery etc – lunch outside trailer with our friends. Beautiful country. Hair cut Mexican style. Mom bought dress and pottery etc. Indian dances at 4pm. Moving pictures in evening. Rail trip to Urupan tomorrow. Monguey – establ?? -molasses flavor – aquaoz – eat lower part. Depot in Patzcuaro – meal time stop. 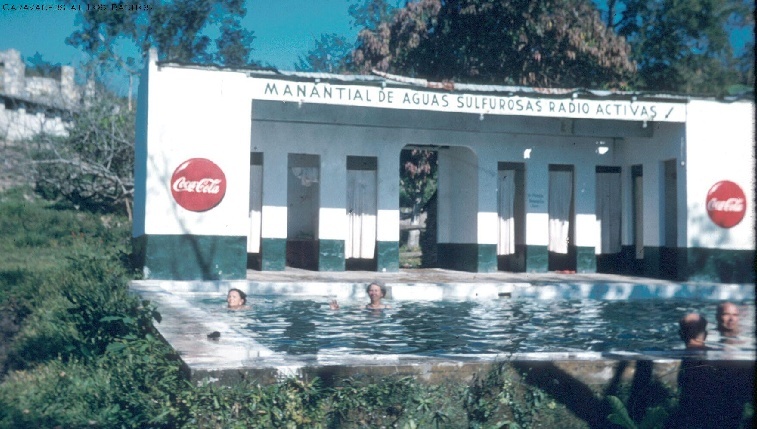 1/24/57 – Guanahuato – arrived about 12:30 – lunch and a chance to rest. Meeting at 4pm – Indian dances at suppertime – a real show. So many things to go to see we don’t think we can make it. This baseball field is almost on top of a mountain. How they ever found a level spot this big I don’t know. Stayed in camp tonight, slides of caravan trip to creba?. We have water and electricity for a change – big day tomorrow. 1/25/57 – Church bells – these cities and towns of Mexico have their churches and really believe in ringing the bells. The weather is warm. You can always tell when you are getting close to a town, the church is the first thing you see. I intend to tour the city with the Luckyknotts. Visited the new theater – beautiful building and the university – amazing how they build these beautiful big buildings on a mountain side. Words cannot describe this city from the food of the ravine or canyon solid rock walls on up the mountainside- beautiful rock work. Arrived at cemetery on top of a hill – visited the mummies – strange how these bodies mummify in this place. Our taxi driver tried to take us – was agreed to pay 50 pesos for a two hour trip for 5 people. He wanted to charge 50 pesos per hour so we let him go and were stranded at the cemetery. Finally got another taxi to take us back to town. Visited the market place for an hour or so, got another taxi to camp. What a thrill – these guys drive like madmen, the streets are all so narrow and crooked you wonder how these taxis and bus drivers ever make a turn without banging in the side of the bus or how they maneuver. Arrived at camp just in time to catch the bus for a trip to the mines and luncheon by the 20-31 Club. visited the older church in Guanahuato – too much gilt and too many images. Many peons were killed in the construction of the church – used now only as a tourist attraction. The mine’s only a short way from the city. Words cannot describe this wonder. The mine and smelter were all one unit, now in ruins. The shaft of this mine is about 225 ft in diameter and so deep that in dropping a rock, it takes 18 seconds to hit the water and they say thats only half way down. Luncheon was in a grove of trees below the dam (Manema) Delayed for 2 hours more. Too many people to be fed. Showed pictures of Creba in the evening.